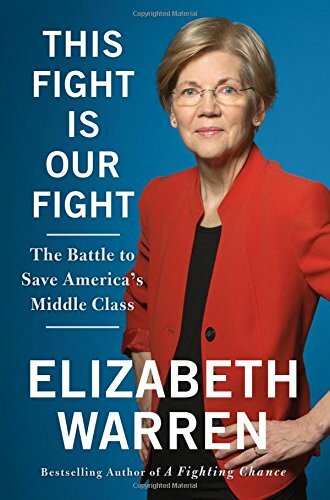 Senator Elizabeth Warren (D-MA) quotes Justice Brandeis in her newest book, This Fight Is Our Fight: The Battle to Save America’s Middle Class. Elizabeth Warren is the leading voice for the working class Americans and has no patience or sympathy for Wall Street executives and CEOs of large corporations. She can be counted on to deliver scathing condemnations of those who undermine the middle class in favor of the privileged few. Warren does not come from money. As she frequently recounts in her books and her speeches, she was raised in a working family that struggled mightily to keep hearth and home together. One characteristic that Warren embodies is her willingness to share her own mistakes, hardships, and bad decisions with the public. It is unusual for any politician to be so open about individual frailties. Warren is outspoken, personable, emphatic, dedicated, and not easily ignored (just ask Mitch McConnell). As a member of the Senate Banking Committee, Warren is in the catbird seat when it comes to overseeing the antics of the “too big to fail” banks like Citibank, Wells Fargo, and Goldman Sachs. Warren relates how, in 2014, she was blindsided by a provision inserted into the budget compromise that Citibank lobbyists wrote gutting the “Prohibition Against Federal Government Bailouts of Swaps Entities” in the Dodd-Frank Act. The Dodd-Frank Act came in response to the banking debacle that tanked the economy and cost millions of jobs, homes, and $22 trillion dollars. The big banks hated the provision because it cut into their profits—the same profits that tanked the economy in 2008 and caused the greatest economic catastrophe since the Great Depression. Warren is vociferous in her denunciation of well-funded lobbyists, corporate CEOs, and Wall Street financiers deciding government policies on banking, trade agreements, tax reform, and the like. And she spares neither major party. Warren makes it clear that Democrats are just as likely as Republicans to retain the services of lobbyists and Wall Street executives. “Fixing the economy” becomes a code phrase for the rich and powerful to increase their corporate or personal wealth at the expense of average Americans. Warren states that former President Obama had as many Wall Street people in top positions as any GOP president. The current administration is comprised almost completely by Wall Street financiers, billionaires, and bankers. In 2013, Warren discovered that Obama’s U.S. trade representative had trade advisory teams composed almost entirely of corporate executives and industry lobbyists. Left out were the labor unions, famers, and nonprofits. Warren is responsible for establishing the Consumer Financial Protection Bureau. The CFPB succeeded in forcing the big banks to return $12 billion to consumers they swindled. In 2016, after being nailed for creating consumer accounts without telling the account holders, the CFPB hit Wells Fargo Bank with a $185 million fine. Now, under a Republican administration and Congress, the future of the CFPB is in doubt, and U.S. consumers will pay the price because the big banks have no intention or interest in protecting average Americans. The United States is not the only country controlled by well-financed interests. Another country comes to mind. It is an oligarchy, run by a powerful few intent on preserving their interests over everyone else’s: Russia. This Fight Is Our Fight provides an insider’s look at the machinations that are undermining the U.S. economy and political system. Warren spells out what is happening and what needs to be done to reverse the slide. Elizabeth Warren continues to be a forceful advocate for the needs of ordinary, hard-working Americans who are not wealthy and whose government appears to hold them in disfavor.